3 months ago I became mother to a beautiful 5 month old baby boy. The magnitude of this has been overwhelming some days – suddenly my life is not my own. It was an adjustment when I got married. There are many treasured moments that belong to my boy and I, or to my guy, my boy and I and these are ours alone. My not working for a while, at least for as long as he was alive and not with us, feels like a public thing. It feels a like I have had to redefine where I fit in my community and social spaces. It feels like a gift and yet one which I have had to intentionally articulate. Recently I was sitting watching my little man and suddenly it struck me that his biggest joy for the afternoon was my just sitting and being with him. He gurgles, he plays, he explores, he cuddles and he checks in in between as his agility and mobility is increasing (way too fast some days for me!). Yet the smile and the giggle that lights up his face when he knows that I have seen him, or am simply being with him overwhelmed me that afternoon. Just being was enough for him. No, I didn’t sit there passively, we engaged and giggled and smiled and made sure that he explored in a way the allowed for discovery with reduced risk of harm. Yes, we feed, clothe and ensure he is cared for. His joy though came from just being. This forced me to question how much value I place on just being. Just being with my guy. Just being with my son. Just being in community with my people. Is there enough value for me in just being present with him to transition joyfully into motherhood, with the lack of sleep some nights and my world suddenly seeming to be so much smaller? Is there enough value for me in being his mom or do I have to own that until this point much of my own validation came from being a part of bigger conversations, being a part of a work space where I knew people’s lives were impacted practically through research and skills and being with them? My word for 2016 was to JUST BE. I am learning how hard this can be some days. This just being his mom. Just being his mom is far bigger, far more joyful, far more overwhelming and far more fulfilling than I could have anticipated. I said no to further post grad studies to explore a relationship with the man who became my husband. I am saying yes to just being my son’s mom. Who knows where that path is going to lead us? We were joined just over 6 weeks ago. 6 weeks of getting to know each other. In these 6 weeks we have had to navigate being a new family with a baby, but who isn’t a new born. We have been exceptionally grateful for the conversations, the listening, the facebook groups talking around things from a transracial adoption perspectives, adoptive parents, birthmoms perspectives and adoptees perspectives that happened in the build up to meeting our boy. We ventured out the house for rambles, just the 3 of us in the first week of being together. In the first week of being together we had already run into questions and statements– some well meant, some simply curious and some just inappropriate re: how our family was joined. We have had to navigate some racial stuff. We have had to navigate questions around his story. We have had to navigate questions around the adoption process and costs. All of this is stuff beyond simply being a family. Beyond simply being a new family. Beyond the (happens to all I know) unsolicited comments and advice. Comments and advice which I know are well meant but don’t always acknowledge that adoption starts with a relationship (or more than one as between birthmoms and adopted families there are foster/ place of safety placements for adoptees too) ending. So regardless of how cute, or little, or challenging our children are, when we adopt, our families start with navigating a grief. My own story involves having to face an awareness that the grief that I have around this creates empathy for my son’s birth mom and yet is not the same. The grief of knowing that you have to say goodbye to someone and step back from their lives and yet they are very much alive. We, my guy and I, both believe that our family story isn’t just ours as the adoptive parents. Not every adoptive family will feel this way. The internet is full of public disclosures by adoptive families. Our family being an adoptive family is already public – we can’t pretend that we are genetically his! Our family story also belongs to his birth mom, as well as to him. We adopted by choice. He needs choices to navigate the world as the world gets bigger and he engages more of it. It needs to be his story to tell. Deeply grateful for friends and family who have honoured this space as well as created safety for us as a new family to be a new family, regardless of our incredible boy’s age! I am a mom to a 6 month old. I have only been a mom to him for 2 and a half weeks. That’s when he joined us – 2 and a half weeks ago. Our plan A – his plan B. His plan A would have been to stay with his birth mom. The bitter-sweetness of adoption is that fact. I am grateful for the sweetness of this boy, of the joy that he is, that he is the first child that my guy and I get to parent together. My heart has ached for his birth mom and him. His first Christmas was with us – not her. This was her first Christmas without him. This has been a tangible grief in the last 2 weeks. Joining our family was the 2nd biggest thing that has happened in his short life. He has had to settle into a new way of being with us and us with him. The reasons for his joining our family and not staying with his birth family is not my story to tell – that belongs to him. Joining us. Not because he is lucky, or because we are extra special. Simply because we have been joined. Matched in a process that was full of incredible grace. We have been joined and belong to each other, with the knowledge that he is linked to another too. The last 2 weeks have been amazing. Overwhelming. Exhausting. Terrifying. Exhilarating. Pretty much what any new mom feels – regardless of whether the baby joined their family through a biological birth process or not. I have been so grateful for the way in which our community has rallied around us – from my mom only being a phone call away – I can’t wait for her to be a short few minutes away – to friends and family who have stepped up, with meals, WhatsApp support and in support of our transition. I have been grateful to my guy who has been open to truly co-parenting –even though the sleep thing is hard and he is/ was averse to body fluids of all sorts. I am grateful that he gets that we are both in a 24/7 commitment with our boy and that in some ways, when he leaves the house, the intensity is different than my being home –and yet that doesn’t minimise the fact that him going out to work allows my being at home – something that we are both grateful for! I have been grumpy, like all new moms, at times, as we settle into this new season. I have been grateful for people respecting the fact that we need to attach and learn each other’s dance before our gorgeous boy gets to engage with others. I have been grumpy from tiredness at times as our small family is only 2 and half weeks old in this sacred, fragile, beautiful adventure and it’s incredible; it’s also still new and unknown as we navigate new ways of being as indviduals, partners and parents. I have been grumpy and oversensitive sometimes when people ask well- meaning questions or offer advice (like happens with ALL parents, new or not) around what our boy does or needs. It’s easier some days than others to field all of this. What he needs, what we need is for our attachment dance to be danced and the rest follows that. His grief at this change (yes, babies grieve), the adjustment for him, as well as figuring out who we are and are we going to keep showing up for him, loving him, feeding him, trying to figure out what he needs is our priority now. Yes, he is 6 months old – so we celebrate all the joys and milestones that come with that but together we are only 2 and a half weeks old. Our boy’s starting point wasn’t with us. It was with people who genuinely cared about him to look after him – but that isn’t the same as being in a family that you belong to – and that brings extra developmental tasks for him and for us to navigate. As individuals and as a family. Not because of anything else, but for the fact that this is beautifully normal in the adoption process. I have reminded friends (and clients) of this in the past. It is my turn to be reminded. Last week we got the call. If you are an adoptive parent, who has waited, or is waiting you will know EXACTLY what I mean by THE CALL. The call to say that our wait was over. The call to say that we can meet and bring home a small person to raise as if he was born unto us, as if he is our own. The call to say that everything we have been intentionally reading, listening, discussing and praying into is about to be made real. In the Christian calendar, we are in Advent. A season of waiting and of hope. My guy asked me last week what I wanted for Christmas. I didn’t really want anything other than for our small person to be home. I said so- in fact I even suggested he call the social workers and put it out there ;)! The next day we got the call. Our personal waiting was over. It’s been a bittersweet time of choosing adoption. I have always wanted to adopt. I have always thought that this makes sense in terms of growing families. I have also wondered what happens to mothers who choose not to raise their children post-delivery for whatever reason (whether through relinquishing their children for adoption or abandonment). I have wrestled with the fact that we are on a register waiting for a child whose birth mother would have had to release him – however that looked for her, as well as him for her. Not out of pity, but simply as I have had to release a child, not born unto me, but one that I cared for deeply into the adoption process and it was one of the most bittersweet moments of my world – I was over the moon excited that he had a family which was going to be fully his. I was devastated that I couldn’t be it. This week I have reflected on the journey to tomorrow and all it has held. From my guy and I debating whether to go the adoption route first or the birth babies first. I have had moments of intense grief for a birth mom who was carrying a baby to term but would not see him grow. I have had intense gratitude and frustration at the fact that this baby is going to be cared for by others between his birth mom and coming to us. I have been sad for the ‘others’ who care for, look after, love and celebrate children knowing that they will have to say goodbye. I have had days where it felt okay and days where it felt awful and like it was never going to be real that we would get the call. The sweetness of meeting him tomorrow doesn’t change the preceding part of his story, or ours. The sweetness of meeting him does change how we engage with the world. The sweetness of him is a reminder that he has a birth mom who has her own story and who we can honour in how we engage with him in our new family of 3, regardless of the story, for she is his birth mom. The sweetness of him is a reminder that there are spaces which are sacred and the journey into parenthood is one of them. We are excited to meet our boy. We are overwhelmed and (beautifully) normal in our nervous anticipation of the pending changes in our worlds. I can’t wait to meet him. To hold him. To snuggle and feed him. To watch him grow. I can’t wait to see my guy in his role as father, protector and guide. New ways of being are going to be unlocked. For the past 3 weeks I have struggled to sit down and focus on writing a blog for someone on practical attachment strategies. I am excited about this field. I am passionate about this field. Yet, I struggled. It was only when journaling that I realised I didn’t want to be writing this for people, I wanted to be doing this with our own child. A friend asked me recently how the wait was going. I told her it was getting longer. I had said that some mornings I wake up and think ‘it’s one day closer to THE day’, but my heart is wanting to start counting hours and not the days anymore. The nappies are waiting for a body to be wrapped around. The bottles are waiting to be used. Our community is waiting for an excited & (I am anticipating!) overwhelmed, this is it message. We are sitting with an increased awareness of the absence of the next person who is going to be a part of our family. ‘Your heart is enlarging and it’s a stretch and it’s a sweet pain’ was her response. I want to stamp my feet and ask how long will this continue. Me – the planner, who for the last 5 years had been able to vision for the year ahead – even if the details weren’t fully known, there was some sense of this is where I was headed. Now, we know that we will be parents to a small person. We just have no concrete timelines. Yesterday, a friend said to me you are in a long labour. It’s not just about being pregnant anymore. It’s about waiting to see that face for the first time. It’s about meeting this small person who we are going to be honoured to parent. I sighed a deep breath out. Our hearts are enlarging and as much as we are relishing the late lie-ins and the spontaneous meals in the park, or walks, or doing what we feel like when we feel like, there is an increasing awareness that someone is not with us. Our hearts are enlarging and we appreciate the well-meant ‘enjoy the season’, ‘make the most of each other’ and all the other comments, but I am struggling with the challenge in this season without any fixed timelines. There is a real tension of being fully aware of the joy in the present (and there is much!) but the longing for what we are waiting for too. Sometimes this longing is painful. I knew that this would be a waiting thing. I don’t enjoy waiting things generally. I am someone who gets up and makes things happen. And in this I can’t. I can cry when it gets too much. It helps – I guess like it has for many mothers whose pregnancies or labours have felt indefinite at times! I can share this with safe people. I can respond with ease when people ask how the wait is going. It was liberating this past week to say to a friend who is on her own adoption journey, that the ‘enjoy just the two of you’ are getting frustrating. We really do enjoy just the two of us, but we are ready for it to be three of us too. We have been dreaming of parenting through adoption since before we got married. In December we decided to start our process in the first part of this year. In April we had our first adoption screening interview. Our hearts are being enlarged. Monday was our 2nd wedding anniversary. I can’t believe that it’s been 24 months to the day since we chose each other – to dream and do life with, but also to wrestle the rough edges off of the other and to see healing come in the parts that only heal in relationship. It was also a day for me that I thought would be a good day to get the CALL despite knowing that it wasn’t likely to happen. It’s okay to dream dreams too. We are in the waiting season familiar to most adoptive parents known as waiting for THE CALL. The call that only comes from our social workers when there is a child who we potentially could be the right match for. The call that only comes once there is no chance of things not being possible. The call that social workers for the child, birth mom and prospective parents are working towards and yet no one can talk about anything with the prospective parents until the time is right for the call. The call that means there is a wait. A wait while you start to nest (and wash nappies) and prepare for a child who you aren’t sure about in terms of preferences, sizes or sleeping habits. (On receiving the call some of this is clarified a little, but how many of us on paper reveal the fullness of who we are in person). A wait in which dreams of babies and bedrooms and nappies and what will our future small look like happen. I catch myself occasionally looking around at people and wondering whether our small grow up with your build, or your eyes, or your skin tone? I know that it won’t be mine, so I am curious to discover what the unique blend of birth/ first parents has created. A wait in which I wish for, and am grateful for, our immediate circles of family and friends being mindful of the bitter-sweetness of the adoption process so that when our small arrives, their immediate world is one which honours the duality of space from before as well as the now and the looking ahead. 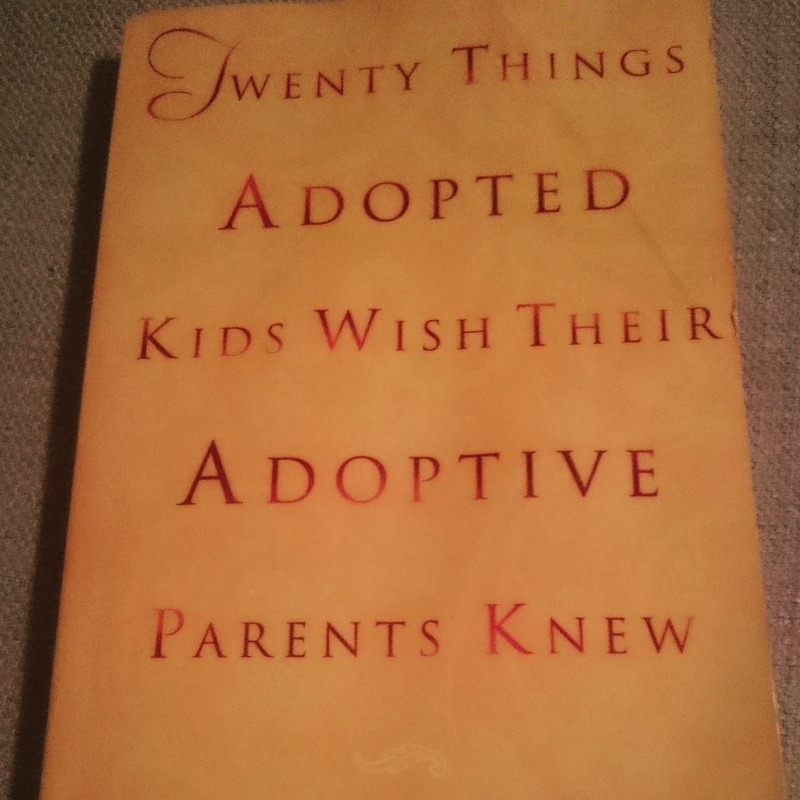 A wait in which grandparents are picking up books and learning from adult transracial adoptees what it means to be adopted and asking questions around this in order to better love their next grandchild. A wait in which future cousins and children in our community are asking questions or figuring things out about the future arrival. A wait in which friends have been excited for us and asking questions. A wait which until this week felt helpful in transitioning. Helpful in preparing us as a couple to be pressing into the space of us. Until this week when it was a lot of just us and now we are increasingly becoming aware of the space that we have created and are waiting for the small one to be the next one of us. A wait in which I pray our small person comes home sooner rather than later so that the gap, grief and loss between saying farewell to a birth family and hello to the adoptive family isn’t longer than it absolutely needs to be. We were always excited for our children to come home, but then one day the excitement turned to a yearning. When she first said this to me, the excitement resonated. The Big Wait. The Paper Pregnant with no deadline. No timeline. Just hope. Lots of it. Hope and an awareness that in the background to our story unfolding, others are happening. One with social workers, acting on our behalf to make sure that our profile is out there for prospective matches. One with social workers wanting to see children permanently placed with the right families for them. Reams of paperwork we completed on file being accessed as is needed to confirm and explore possibilities. A child, whose story we don’t know yet, having to cope with hard goodbyes and temporary hellos until we have the privilege of parenting him. A birth mom, who may or may not still be around this child – I have no idea of her story but she is an important part of ours, not just as the birth mom of our small but as our family grows in the years ahead. Our community anticipating with us, praying with us, holding open hearts and dreams with us. Our community blessing us with practical gifts. Blessing us with a celebration and gathering of family and friends to welcome us to first time parenthood together with a shower and a braai – my guy is an important part of this all. Our community getting frustrated for us in the wait – more than us most days! Our community embracing our process and while not seeing my belly grow, are making space anyway in our worlds for our future child. Us talking about the things we are excited about and the things we are nervous about. Us dreaming what we would like the new rhythm in our family to be like. Us talking about working mom, part time working mom or full time mommy space for a season. Us talking to our families and friends about our feelings in this process. Me waking up and thinking about what and how to arrange the second room. Me reflecting on the professional things my brain knows and needing to work these through with a professional of my own in anticipation. Me remembering the fear & grief of losing pregnancies and knowing that this is a definite thing. Me recognising that I am not going to have all the answers and get this right every time and that showing up consistently to try and figure things out is what matters. Walking this journey is teaching me more about faith – we hope for things that we do not yet see to quote Hebrews 11:1. It’s confidence of what is coming. It’s assurance of what I don’t see. It’s the conviction of knowing this and preparing to do the things that need doing.